Is Megan Draper Becoming Sharon Tate? One proof of Mad Men’s greatness, for me, lies in its ability to support endless, sometimes contradictory theories. Every Monday morning when it’s on the air, approximately 17.6 percent of Internet chatter is devoted to reading Matthew Weiner’s tea leaves—and every week, a great deal of that amateur analysis is utterly convincing. This week’s episode, “The Better Half,” was particularly juicy. Slate’s Seth Stevenson, for example, made some exceptionally perceptive points about its Jungian duality. And over at Warming Glow, Dustin Rowles pointed to a discussion that first surfaced on Reddit, linking Megan Draper to Sharon Tate, a model and actress—and the wife of Roman Polanski, a powerful shaper of images—who was murdered by the Manson family in 1969, when she was eight and a half months pregnant. Earlier this season, Megan, currently enjoying some success as a soap-opera actress, revealed that she, too, had been pregnant, although she miscarried. She lives in a beautiful, but vulnerable apartment—a few weeks ago, an elderly woman gained access by simply walking through an unsecured door—in a city that’s experiencing serious social disruption. The biggest clue, though, was that Megan wore a T-shirt just like one worn by Tate in a 1967 photo shoot. (See the still from the show on the left.) The Megan-Sharon connection went from fanciful to undeniable once Mad Men costume supremo Janie Bryant responded to a tweet from the daughter of the man who took those 1967 photographs asking if Tate had “inspired Megan’s look.” Bryant’s answer? “no coincidence!” Apparently, Bryant really did have those photos in mind. What does it all mean? Well, that’s harder to say, obviously. Matthew Weiner seems to take particular pleasure in making viewers anxious about his show’s characters. In Season 5, the writers expended a good deal of energy generating concern for Pete Campbell. They titled the episode in which Pete was learning to drive “Signal 30,” which was also the title of a driving-safety movie that featured images of dead and severely injured drivers in mangled cars. And yet one year later, that conflicted, contradictory weasel of a man still walks the Earth. Despite Weiner’s history of misdirection, I am very worried about Megan. 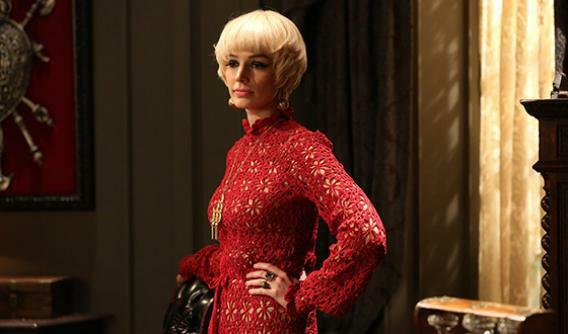 If there’s one area in which Mad Men enforces a subtle but strict code, it’s in the realm of costuming. As Tom & Lorenzo have chronicled in their spectacular “Mad Style” series, Janie Bryant often uses wardrobe to signal what’s ahead for the characters. Following that lead, Tom & Lorenzo actually likened Megan’s style to Tate’s back in March, before the season even began. 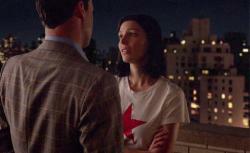 And, in their post on “The Better Half,” they not only link Megan’s and Tate’s shared taste in T-shirts, they also note that throughout the episode Megan’s clothes share several elements with Peggy Olson’s boyfriend Abe’s. In case you didn’t notice, during the course of this episode, Abe was stabbed in the arm by street thugs and then speared in the stomach by Peggy. In other words, it wouldn’t surprise me one bit if later this season we see Megan wearing a hospital gown—or perhaps even Don Draper in black.